SHE'S A WILDCAT, by Fastnet Rock. Unraced. Sister to FOXWEDGE, SHE'S A FOX, Paulownia. Dam of two named foals, one to race. FOXWEDGE (Fastnet Rock). 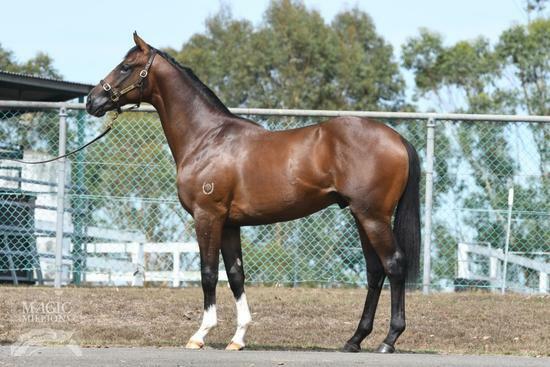 5 wins-2 at 2-at 1100m, 1200m, A$952,450, MVRC William Reid S., Gr.1, ATC Roman Consul S., Gr.2, San Domenico S., Gr.3, Clarry Conners 2YO P., STC Always Recycling 2YO H., 2d VRC Coolmore Stud S., Gr.1, ATC Run to the Rose H., Gr.3, 3d VRC Newmarket H., Gr.1, ATC Todman S., Gr.2, 4th ATC Golden Rose S., Gr.1, VRC Lightning S., Gr.1. Sire. SHE'S A FOX (Fastnet Rock). 3 wins-2 at 2-at 1100m, 1200m, A$168,850, ATC Rosebud H., L, Optus Sprint 2YO H., Ainsworth Gaming Technology H., 3d VRC MSS Security S., L.
Paulownia (Fastnet Rock). Winner at 1200m in 2017-18, 2d Wellington Guineas, Gr.2, Waikato RC Seafood Bazaar S.
Banksia. 2 wins at 1000m in Aust. Larch. Winner at 1200m in Aust. Wall Street Lass. Winner at 1200m in Aust. Forest Native (Forest Wildcat). 3 wins. See above. Hawkish (Bianconi). 6 wins-2 at 2-from 5f to 8¼f, 3d Oaklawn Park Mountain Valley S., L.
Turbo Time. 2 wins at 5f, 5½f in U.S.A.
Bank on It. Winner at 6f in U.S.A.
Plan Ahead. 9 wins from 5½f to 8½f in U.S.A.
Red Missile. 7 wins to 1400m in Venezuela. Major Jonathan. 6 wins from 5½f to 8¼f in U.S.A.
Redraw. 5 wins-1 at 2-from 6f to 9f in U.S.A.
El Goya. 4 wins to 1500m in Peru. COUNT THE TIME (Regal Search). 12 wins-2 at 2-from 6f to 9f, US$677,499, Fairmount Derby, Gr.3, Arlington Park John D Hertz S., L, 2d Louisiana Downs Super Derby, Gr.1, Arlington-Washington Futurity, Gr.2, Sportsmans National Jockey Club H., Gr.3, Arlington Park Explosive Darling H., L, Fort Dearborn H., L, Calder Thanksgiving Day H., L, 3d Keeneland Breeders' Futurity, Gr.2, Calder Tropical Park H., Gr.3, Ak-Sar-Ben Omaha Gold Cup, Gr.3, Sportsmans Chicago Loop H., L, Fairmount Park Cardinal H., L. Sire. MISS TIMEBANK (Water Bank). 3 wins. See above. Timebank (Water Bank). 4 wins, 2d Hollywood Park Bel Air H., Gr.2, Vernon O Underwood S., Gr.3. Sire. Overbrook (Water Bank). 5 wins-1 at 2, US$219,850, 2d Los Alamitos Orange County H., L, 4th Hollywood Futurity, Gr.1. Roaming (Quality Road). Winner at 2, 2d Woodbine Ontario Debutante S., L, Glorious Song S., L, Duchess S., L, 3d Woodbine Ruling Angel S., L.
ROLE ON FORLI (Broadway Forli). 9 wins-2 at 2, Canterbury Park Governor's H., L, 2d Assiniboia Downs Manitoba Sprint Championship H., L.
Race Record: 1 Starts 0-0-0 A$1,000.